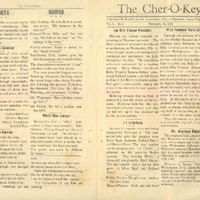 The Cher-O-Key, the bimonthly school newspaper published by the Journalism Club of Cherokee Junior High School, which was located at 550 South Eola Drive in Orlando, Florida when it opened in 1927. The Volume I, Number 6 edition was published on February 21, 1929 and cost one cent. Articles in the newspaper include the election of Joe Bird as Student Council President, musical productions by seventh graders, a speech by Miss Freeman of the Orlando Ice Dealers Association, a performance by Mr. Westover, student editorials, a calendar of events, a contet spondered by Cher-O-Key, club news, Student Council news, readings performed by Florida Routh, personal news from students and teachers, sports news, an athletic calendar, and the Who's Who contest. Original school newspaper by Ruth Wetherington, ed. : The Cher-O-Key Vol. I No. 6. February 21, 1929: Private Collection of Thomas Cook. Digital reproduction of original school newspaper by Ruth Wetherington, ed. : The Cher-O-Key Vol. I No. 6. February 21, 1929. Election day proved intensely interesting at Cherokee last week. The three candidates who were introduced in auditorium on Wednesday, Feb. 6, were of equal merit and consequently competion and excitement ran high throughout the day. The candidates were each announced by a student sponsor. Betty Meyer introduced Betty Trimble, Sammie Bethea introduced Richard Lawson, and Bob Gisler told us of Joe Bird's particular merits. Each gave a short speech, urging the votes of the students for one particular person. Balloting revealed that Joe Bird, of section 8-5, was the choice of the students. Everyone feels that the students have selected wisely and that Joe will live up to the standard set by the past presidents. Section 7 report a very interesting program for February 5. The committee who gave the program were Myer Sigal, chairman, Richard Ezzard and Robert Gisler. The first number on the program was “La Cinder", a selection on the piano by Beulah Laverty, “The Novelty Waltz," a piano solo was given by Fred Mauer. The last number was a one act play given by Myer Sigal and Richard Ezzard. Bobby Denney: No girl ever made a fool out of me. Roland Parker; Well, who did then? Through the courtesy of the Orlando, Ice Dealers Association, Cherokee students were fortunate in hearing Miss Freeman speak last week on the subject "Refrigeration." In her talk, she pointed out the benefits of a good ice-box and how food is affected when kept in a poor one. Some of the point which Miss Freeman stressed in her lecture were that a refrigerator should have good circulation, that food could not be preserved at a temperature over 60 degrees fahrenheit, that an ice box should be washed with cold water rather that warm, and that food should never be set out of the ice box very long. In the course of her lecture she pointed out that foods having a smell, such as cheese, should be kept on the top shelf of the ice box, so as not to transfer it to the other foods. This information was gladly received and greatly enjoyed by the students and teachers. The students had a great time while Mr. Westower entertained with some very clever stunts and tricks in auditorium, Wednesday, February 6, Mr. Westower came to Cherokee last year and is a great favorite with everyone Cherokee is eagerly anticipating his next visit. Pictures of Mount Vernon and Washington, D.C. adorn the bulletin board in honor of our famous presidents, Washington and Lincoln, whose birthdays are this month. This was a project of the Student Council of last semester. Girls and boys alike are preparing for their basketball tournaments. This promises to be a very successful season as a number of the students are participating. Very few students are ineligible this spring. Below is a calendar of inter school athletic contests for the Junior High Schools for the remainder of the school year. In planning your work and play please keep these dates open. These contests are regarded as all-school affairs and your support is expected in putting them through successfully. All of these events will take place during the afternoons of dates indicated. Exact time and place will be announced later. A general admission of 10 cents for pupils and 25 cents for outsiders will be charged at these contests. And ghosts of vanishing joy pain. Miss Graham: Do you think it is correct to say, "He summers in the country?" Howard Davis: Why not? You can say, “He falls in the mud" or "he springs in the water." History teacher: What is meant by the “Spoils System?" Paul Dowd: Well, Jackson gave his friends positions and it spoiled them. Mr. Thompson: How did that aviator get killed? Mr. Meyer. He had a sudden sinking spell. Section 8-I held a "who's who’ contest in home rome recently. Sally Fletcher, Gladys Cassel and Howard Davis took the lead. The winners in this contest have been placed on an attractive poster, which is on the bulletin board near the front entrance. The poster was made by Athlone Williams. Students made their selection for second semester clubs Tuesday and attended the club of their choice Fliday. Some interesting new clubs have formed for the second semester, while many teachers will continue with their original ones. Among the new clubs are the Leaders Club, sponsored by Mr. Wright; the Astronomy Club with Miss Tate; the Latin Club, Mrs. Benton; the Algebra Club, Mrs. May. mard; the Hiking Club, Miss Brown; the Who's Who Club, Miss Ledford; the Camera Club, Mr. Lewis; the Book Reading Club, Miss Ford. Sammie Bethe(a? ), captain af sergeants. These officers with the faculty advisors constitnte(?) the executive committee of Student Council. Joe Bird expressed his appreciation of the honor given him by the students and asked for their co-operation during the coming weeks. "The Coquette Conquered," both written by P. S. Dunbar. Florida also gave these numbers at the February meeting of P. T. A. where was also greeted by an enthusiastic audience. Martha Wright spent last Sunday at St. Augustin. Laura Smith visited friends at Lakeland last week. Cora Lee Davis spent last Sunday at Silver Springs. Thelma Albritton visited Mountain Lake last Sunday. Martha Ruth Rathburn spent Thursday in Tampa. Janet Gould motored to St. Augustine last Sunday. Gladys Cassell and Sally Fletcher spent last Saturday in Montverde. Last Semester Mr. Myer made a request that students bring ferns to plant on the school grounds. Enough of the plants have been brought to set two rows around the building on the north side. This adds much to the attractiveness of our already beautiful building. Students regret the illness of many of the teachers during the past two weeks, Mr. Thompson has suffered double injuries, through a sprained foot which resulted from a collision on the basketball court, and a visitation of the flu. The student body expressed their sympathy by sending him a flower shower on Tuesday. Others who have been incapacitated were Miss Broadbent, Miss Tate, Miss Mitchell, Miss Graham, Miss Jones. February 27: Boys Hi-Y will present program. Harken one Harken all! The Cher-O-Kay is sponsoring a contest. This is absolutely something new in the line of a contest at Cherokee, The idea originated with the journalism club when the members were madely writing verse—or worse—to fill up the columns of the paper. Limerick writing became the rage in one short period. The club wants the students to join in the spirit of the hour. The person writing the best limerick involving the idea of Cherokee and "The Cher-O-Key" will receive an issue of every Cher-C-Key free until June. The contest is on. Limericks may be submitted to room to; for a period of one week, ending Friday, March 1st. The winner will be announced in the next issue of the Cher-O-Key. They say he's the very “last word"
He's Cherokee's president the third. It has been brought to the attention of the administrative board at Cherokee that students have become careless in their use of the property of other people. This building, and its equipment, which is a monument to education in our city, has been given to all of us, not to any one of us. Nor is it ours alone, but it also belongs in part to the students who will follow us when we are in higher Institutions of learning. Will our future citizens at Cherokee wish to enter a defaced building, whose walls have been marted with pencils, whose exterior still bears the sign of dusty erasers, and whose desks are scratched and marred? These questions we should consider seriously when we feel inclined to make numerous little destructions that seem a part of our nature. Decidely we have the most beautiful building in the city. Let us strive to keep it “The School Beautiful" in its picturesque setting "The City Beautiful"
The new staff of the "Cher-o-key" will be announced in the next edition. Watch for it! “Cher-O-Key (February 21, 1929).” RICHES of Central Florida accessed April 24, 2019, https://richesmi.cah.ucf.edu/omeka/items/show/983.